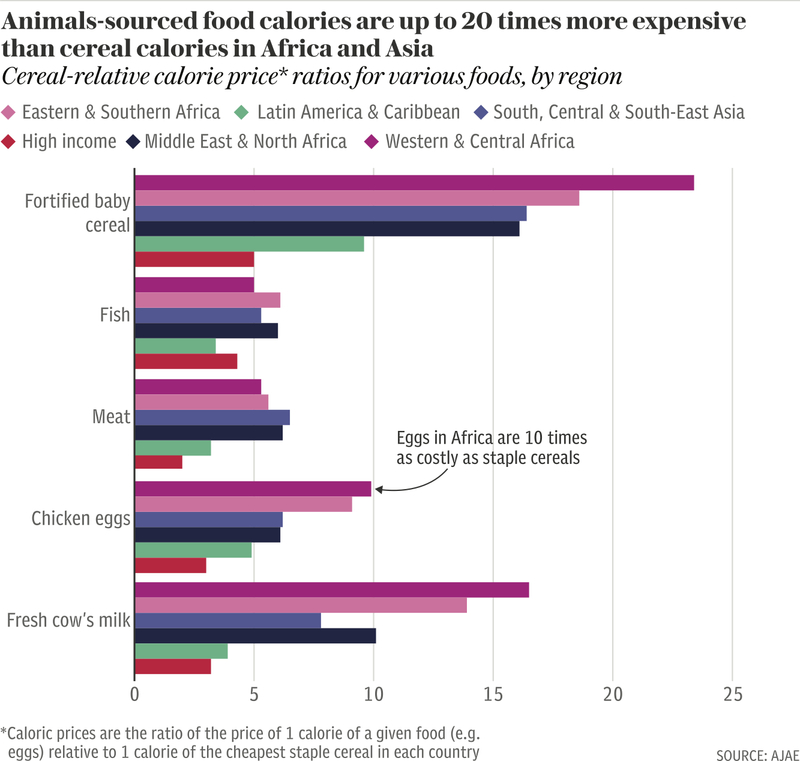 Derek Headey, a senior research fellow at the CGIAR’s International Food Policy Research Institute, yesterday published an opinion piece in The Telegraph on the importance of using milk, meat and eggs to fight malnutrition and stunting in the developing world. But, Headey warns, these ‘animal-sourced foods’, particularly fresh milk and eggs, are prohibitively expensive for poor households. When poorly nourished children in developing countries fall behind in their physical growth and become stunted relative to their healthier peers, they tend to fall behind in a lot of other things too: their health, cognitive development, schooling, and eventually, their productivity and income as adults. The high social and economic costs mean that there are high returns to preventing stunting, provided these actions happen early. ‘In poor countries most growth faltering takes place from six months of age until a child’s second birthday. . . .
‘When children are fed well and protected from infections their bodies and minds develop quickly in infancy; but when these conditions aren’t met, they fall behind and may never catch up to their healthier peers, physically, socially or economically. But getting sufficient nutrients into a baby’s growing body is not easy for poor households. ‘. . . In poor countries, the standard household diet that infants are introduced to from six months of age onwards is often nutrient-sparse: mashed-up rice, roots or tubers, or perhaps a watery porridge made of local grains. The solution is getting parents to feed their children more nutrient-dense foods. ‘Animal-sourced foods—or ASFs—fit that bill, being rich in high-quality protein, essential fatty acids, multiple micronutrients as well as more mysterious growth-promoters, like the insulin-like growth factor 1 found in cow’s milk. ‘Recent studies from the Advancing Research on Nutrition and Agriculture (ARENA) project suggest that there are significant benefits to giving children more animal-sourced foods . . . .